Decker Marketing » What’s Here? Announcing Mass Relevance! For the last couple years I’ve thought a lot about where user generated and social content are going. It’s valuable, but growing exponentially, more of it is real-time, and there’s a difficult-to-manage fragmention of customer experiences. I’m excited to announce a company my co-founders and I have formed to go after a big market problem. Today we announced the launch and funding of my new company, Mass Relevance, co-founded with Brian Dainton and Eric Falcao. You can see early coverage at the Statesman, AustinStartup (more full story here) and TechCrunch. I foreshadowed this announcement with a market thesis post I just wrote, and the point that there’s a big content gap in the market. 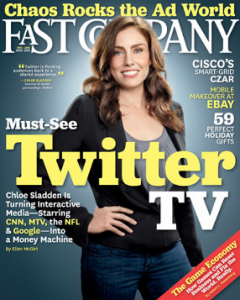 Also, there was a serendipitously-timed cover story in Fast Company on Twitter and TV that is at the bullseye of what Mass Relevance is doing, specifically serving entertainment and media. And you can see this blog post by Brian on how Twitter (and our product, TweetRiver) can help rescue live TV. We will have our website up soon, with a Mass Relevance blog. In the meantime, I’ll update you here and on Twitter through @samdecker as well as @massrelevance. Austin, Texas — December 21, 2010 – Social marketing innovator Sam Decker today unveiled Mass Relevance, a new company that helps consumer brands effectively use real-time social content to drive engagement on television, web, and mobile. Founded by Decker, a former Dell executive and founding CMO of Bazaarvoice, and joined by co-founders Brian Dainton and Eric Falcao, Mass Relevance is aimed at content and marketing executives who want to activate engaging experiences via real-time conversations, commentary and insights culled from millions of social activities taking place every moment around the globe. The company uniquely combines a cutting-edge social syndication technology that can instantly aggregate, curate and deliver the best content for any context with an enterprise SaaS infrastructure to meet the needs of the needs of the Fortune 500. Decker, who will lead Mass Relevance as President and CEO, is known across the industry as a marketing innovator who pioneered social commerce as a category and delivered measurable results for 1,000 leading brands like Best Buy, Macy’s and Dell. Mass Relevance also announced that it has secured nearly $2 million from FLOODGATE and Austin Ventures in a Series A round, and FLOODGATE’s Mike Maples, Jr. will take a seat on the Board of Directors. Mass Relevance has attracted tremendous interest from the venture community and the highly competitive round remains open for a few more strategic angel investors in the media and entertainment industry. An explosion of social experiences has hit the mainstream. Consumers are increasingly connected to people, brands and content through Facebook, Twitter, Foursquare, others – and contributing more and more content through mobile devices. Twitter hosts 30 million tweets about TV shows each day, and Facebook is expected to double in size from 500 million to 1 billion profiles in the next two years. As social continues to grow exponentially, so does the challenge for brands, media, and retailers. Consumers are demanding that a growing percentage of their experience be geared towards content from their peers. However, interactions are becoming more fragmented, multiplying the complexity of engaging audiences. New opportunities to engage consumers exist – but success requires matching the right “useful” social content to the right audience in real time. In this world where social is valued above all else, a platform to find, curate and display relevant social content is a tremendous competitive advantage for brands, media and retailers who want to attract an audience. Mass Relevance is uniquely positioned to help brands drive real-time engagement through social syndication that delivers the most relevant social content for a given context that includes time, place, audience and desired outcome. The company is the first to provide a complete stack of SaaS social aggregation, curation and syndication technology and services that allow brands to engage audiences with real-time content. These experiences deliver tangible engagement metrics like audience viewership, time on site, page views, ad views, conversions and sales. Decker brings more than 17 years of leadership in digital marketing, social commerce, and start-up growth to his role as CEO of Mass Relevance, including the ability to precisely identify the emerging needs of businesses and innovate measurable, high-impact solutions to new challenges. As founding CMO of Bazaarvoice, Decker helped build the core platform of Bazaarvoice’s products and helped drive the company’s growth to category leader serving 1,000 brands. Before joining Bazaarvoice, he spent 7 years of leadership at Dell in the marketing, eBusiness and customer-centricity. At Mass Relevance, he will work hand in hand with co-founders and premier Ruby developers Brian Dainton and Eric Falcao, who will serve as Director of Products and Director of Platform. In addition, Decker has tapped the expertise of the thought leaders and visionaries who are defining the next era of media and content to serve on the Mass Relevance Advisory Board. These include: Ze Frank, one of the world’s foremost experts in the intersection of technology and creativity in web design, marketing, and new forms form of media; Jonah Bloom, former Editor of Ad Age and current CEO and Editor in Chief of Breaking Media; Brad Berens, Chief Content Officer for ad:tech, the iMedia Summits and the CMO Network and Senior Research Fellow at the USC Annenberg Center for the Digital Future; and Mike Edelhart, a long-standing media and Internet start-up investor and executive. Based in Austin, Texas, Mass Relevance helps entertainment, media, retail, and manufacturing brands drive real-time engagement through social syndication. The company is privately held with venture capital funding. For more information, please visit the company’s website at www.massrelevance.com.